After Daniel Hillard (Robin Williams), an unemployed actor, loses custody of his three children to his ex-wife (Sally Field), he realizes that seeing his kids once a week just isn’t enough. So the crafty thespian dresses as “Mrs. 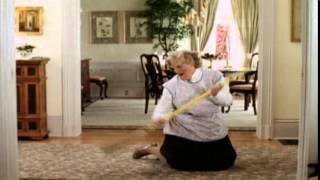 Doubtfire,” an elderly British nanny with a sharp tongue and an endearing way with children, in order to be close to his kids in this bright, heartwarming comedy.